IN HIS remarks to the White House Correspondents' Dinner in April, President Obama pledged that his administration would work tirelessly for the freedom of Jason Rezaian, the Washington Post reporter who has been held hostage by Iran since last summer on spurious espionage charges. 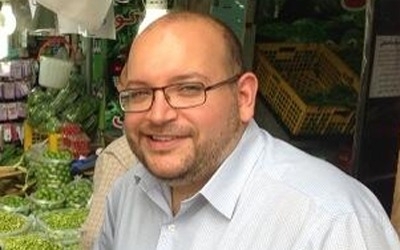 The Washington Post's Tehran bureau chief, Jason Rezaian, is being tried in Iran on bogus espionage charges. "Jason has been in prison for nothing more than writing about the hopes and fears of the Iranian people," Obama said. "We will not rest until we bring him home to his family, safe and sound." Yet just four days later, the president warned Congress that he would veto any bill making approval of a nuclear deal with Iran contingent on the release of Americans in Iranian captivity. Obama may want the mullahs to set their US hostages free. But he wants that nuclear deal more. On Monday, Obama boasted to a gathering of young Southeast Asian leaders that as a result of his policies, "today, once again, the United States is the most respected country on earth." Could anyone swallow such a risible claim without, as Hillary Clinton might put it, the willing suspension of disbelief? It's hard to think of any nation on the planet that holds America in higher esteem because of the Obama presidency. Iran surely doesn't. Time and again, the White House has bent over backward to "engage" the Islamist regime in Tehran. At every step its overtures have been greeted with scorn. The seizure of innocent Americans like Rezaian — whose trial, in a closed courtroom, began last week — fits a pattern of hostility that seven years of outreach and indulgence by the Obama administration has failed to soften. "We will extend a hand if you are willing to unclench your fist," entreated the president in his first inaugural address. But Iran's theocratic leaders have not unclenched their fists, not even when it would appear to be in their interest to do so. The nuclear accord being pushed so fervently by Obama and John Kerry would be a dream come true for the Islamic Republic's rulers — generating tens of billions of dollars in sanctions relief, legitimizing their eventual path to the bomb, and entrenching Iran's malignant regional hegemony. Yet hungry as they are for this deal, they know that Obama is hungrier still. No provocation, no act of aggression, no insult by Iran has been enough to make the White House walk away from the negotiations. 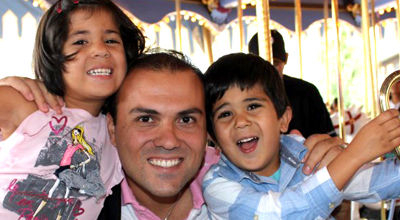 American pastor Saeed Abedini, seen here with his two young children, has been held in Iran since 2012. He was sentenced to eight years imprisonment on charges of undermining national security through worship gatherings held in private Christian homes. Rezaian isn't the only US hostage in Iranian hands. Saeed Abedini, 35, is a Christian pastor from Idaho who was arrested in 2012 while on a humanitarian trip to Iran to help establish an orphanage. He was convicted in 2013 "undermining the national security of Iran" and sentenced to eight years in prison. Amir Hekmati, a decorated US Marine, was born in Arizona and raised in Michigan. He was seized in 2011 while visiting his grandmother in Iran, accused of spying, and sentenced to death (a sentence later commuted pending a retrial). Robert Levinson, a former FBI agent, vanished during a trip to Iran in 2007. Iran's state-run media reported at the time that he was in the hands of the security services, making him one of the longest-held US hostages ever. The brazen detention of American citizens is an outrage. The refusal of the White House to call a halt to negotiations until the men are released is a humiliation. Iran has an odious history of abducting guiltless Americans, then using them as bargaining chips to trade for some concession from Washington. You'd think Washington would have learned by now that ransoming hostages only reinforces the incentive to seize more hostages in the future. It is mind-boggling that the president would threaten to veto a measure making the freedom of the four US citizens the price of any more nuclear talks. Can Obama truly believe that this is the way to make America "the most respected country on earth"?